Ottawa Horror went to see a movie! 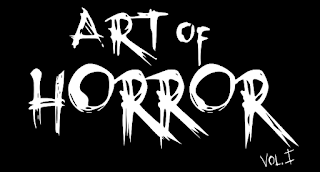 "From Rue Morgue publisher Rodrigo Gudino, comes this film-festival darling. Spirits linger on a property inherited by an antique collector, though it seems he is the proud owner of something far more dark than a haunted house," as I mentioned in a recent post. A few days before I went to see The Last Will and Testament of Rosalind Leigh, I went for dinner. Eating alone is something I do often, as I was waiting on a fellow author to join me for a drink afterward. Halfway through my meal, I happened to drop my knife on the floor. How right you are! I thought of the knife, which pointed steadfast at the vacant chair across from me. A man is indeed coming to visit! But I already knew that, fool. See, my grandmother was full of these old gypsy-witch omens. Never superstitious really, she just seemed to have a divinitory tool attached to every happening, no matter how mundane. This was one that stuck with me. Maybe I drop a lot of cutlery, or have a lot of visitors? So, seeing the needlepoint on the wall in the film made me smile. Not only since I'd heard a version of this all my life (my mother repeats these wives tales too) but having it cross my mind only days before was so novel. a man will come to visit. If a spoon, a woman will come. Our version was different, and I wonder if this superstition was nudged gently for the script, or is taken from one of the many versions and sayings that already exist. As they say in The Simpsons, "Alright, alright, you win. I see you've played Knifey-Spoony before!" Enough about my own knify-spoony. A fork is dropped, and hence, my enjoyment of 'Rosalind Leigh' and her creature from the woods. Much thanks to Andrea and all at Sinister Cinema, Rue Morgue and Raven Banner, who allowed Ottawa Horror to catch this film on the eve of Ottawa ComicCon. I settled in to watch with our own Amy Von Purr, who is working toward a masters degree in film, and the co-ordinators of Ottawa Goth, Eric and Kelly. This made for great discussion afterward. We are all students of film and darkness to one degree or another. High-points for us were the set, camera work and effects. As with all other reviews I have read since seeing this, the set was perfection. Learning that nearly all of the furniture and artifacts reside in the house lent to knowing the dust was real dust. The light through stained glass had fallen there naturally and continues to. The general character of the house was largely its own and not a sound-stage construct. This is a wonderful thing in film today, to give up the smoke and mirrors for in-situ smoke and a bona-fide mirror. From the start, when Poole enters the house, you get the sense of isolation. It's so quiet and kept quite dark. Having held a stedi-cam rig once, we also marveled at the camerapersons skill. Smooth and seamless shots establish the mood and take you on a tour of your 82-minute home in one fell swoop. There are shots that come down a stairway that is no doubt a tight fit. Going from tripod, handheld, rails and rigs can sometimes be apparent, but this film remains fluid regardless of what tactics were used to capture shots. It is one thing that held our attention from the start. Going entirely outside the natural look of the set and lead actor, the creature was so well done it gave one of us shivers. There is a cat-like look to the face, which we get to see. That was one thing I felt was done very well. There is just enough of a tease to see the figure int he dark, and once you do, it is revealed in full glory but not dissected. There are no showboat type shots that serve as some kind of portfolio masturbation for its creator. Instead, the creature as a character is revealed quite artistically and beautifully. Then, this... Thing... has nothing beautiful about it. It is all at once dark, terrifyingly strong, otherworldly and repulsive. Slow pacing and quiet horror seem to come across as a negative to some viewers. We knew what we were to expect from headlines alone. You have to take all you know of Rue Morgue Magazine (the blood, the screams, the laughs and good fashion sense) and toss it out to deal with this film on its own. The blurbs don't lie. It is mesmerizing. It is dark. It is creepy. Other films that have this silent and still mystique are not touted as a 'white-knuckle roller-coaster rides' so those who knew what to expect were pleased. Even those who went in blind were reminded of other favorites like (the Hammer remake of) The Woman In Black, The Others, Death and the Maiden, The Shining, and 2001: A Space Odyssey. All very powerful and quiet films suspiciously devoid of car chases or the old hack and slash. One thing it also has in common with other atmospheric and dark films is fitting sound design - yet there was no dynamic range to it. Some sounds were recycled when even once was enough. Amy noted she was uncertain at times if the noises were digetic or non-digetic sounds which created confusion among us, who were not only normally highly forgiving, but also enjoy a healthy amount of experimentation in film. I had not known the technical term but expected the character to react strongly to sounds I was hearing and when he didn't, I was momentarily removed from the narrative. Luckily, the sounds were fitting and interesting, and I was transfixed visually during the actual viewing experience, so this took little away, but was definitely noted. It is fun to point out the director cameo with Rodrigo Gudino in the role of a police officer that comes to the door. many cult-favorite writers and directors seem to sneak themselves in so I hope this is a trend for him. The bit also serves as a reminder that though Poole is the only actor you see in the house for most of the film, he is not the only actor you see. True, most are disembodied voices via telephone, videocassette, memories, or online. The lack of other characters, and the ingenuity shown in portraying others through devices and doorways was another high-point for me. A film that makes you think and is naturally a little more true-to-life when much of our daily interactions with friends and family is not face-to-face but in the form of text, Skype, social media and telephone It is one of the charms of 'Rosalind Leigh', being other-worldly yet right at home for me. Outside of the videocassette 'Believe', I think Poole is the only person moving his mouth on-screen. Well, the creature does as well... but we will let you chew on that after you are fed the ending of the story for yourself. 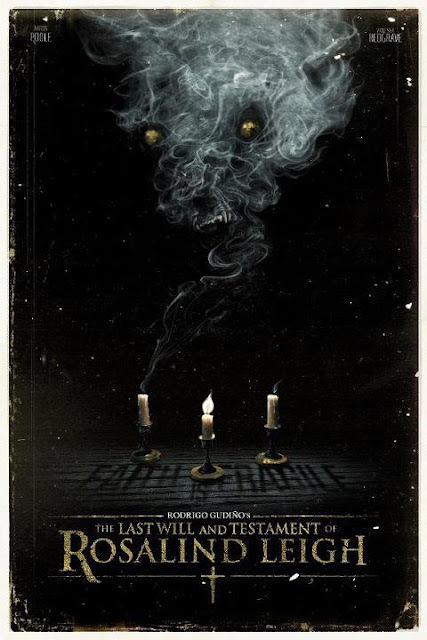 The Last Will and Testament of Rosalind Leigh is part of the Sinister Cinema tour and one of four titles to be hitting theatres across Canada. For details, check Cineplex to see the next installments, American Mary and No One Lives. a note from typicallydia: as an apology and explanation for the lateness of this review, consider: I am very pleased that I was able to write this as my last regular submission to Ottawa Horror. It has been an exceptionally fun and rewarding engagement. After meeting so many amazing people, taking photos and writing these great posts, it is hard to step away. Thank you all for reading, the sharing, and most of all the scaring!